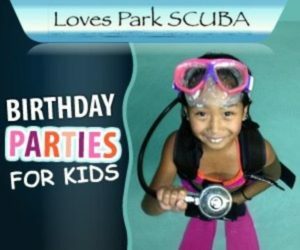 Come and celebrate your child’s birthday with them and 14 of their closest friends here at Love’s Park Scuba. Our 85 degree heated indoor pool is a perfect winter birthday the kids are sure to enjoy! $175 – Click here to download the liability release form. • Pool time for up to 15 kids! • Kids under 10 are OK to swim with long-hose regulator! • Room for presents cake and ice cream only after the dive! • Each diver gets a pool diver identification card! 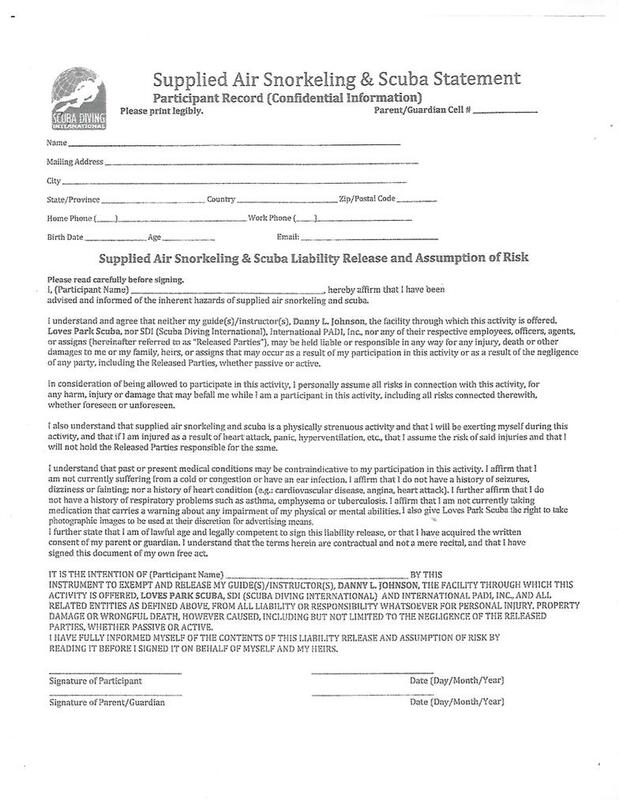 LIABILITY RELEASE FORM FOR PRINT. IT MUST HAVE BOTH THE PARTICIPANT’S SIGNATURE AND A PARENT/GUARDIAN’S SIGNATURE TO BE VALID. ON MOST COMPUTERS, RIGHT-CLICKING AND SELECTING “SAVE IMAGE AS” WILL ENABLE THE FORM TO BE SAVED TO YOUR COMPUTER. RIGHT-CLICKING AND SELECTING “OPEN IMAGE IN NEW TAB” AND THEN SELECTING “FILE”, THEN “PRINT” FROM THE DROP-DOWN MENU WILL WORK AS WELL. IF THE FORM DOESN’T LOAD IMMEDIATELY, PLEASE WAIT A FEW SECONDS BEFORE REFRESHING THE PAGE. THE PARTICIPANT, NO MATTER THEIR AGE, MUST SIGN AND DATE THE FORM ON THE LINE JUST ABOVE WHERE IT SAYS “SIGNATURE OF PARTICIPANT”. WE LOOK FOWARD TO MAKING YOUR CHILD’S BIRTHDAY PARTY ONE TO REMEMBER!! !